Clocks and calendars do not adequately describe the notion of time for me. I understand that they evolved as tools to assist in the planting of crops in Babylonian times, and guide the timing of other events. There is a subset of humans who delight in measuring things, and in constructing a conceptual framework that explains why things are the way they are. This is why we have mathematics. If these people are in charge, their way of looking at the world becomes accepted as “reality”. So clocks and calendars measure time in a linear fashion. The passage of days and nights, seasons and years is stuffed into square boxes and sliced into segments of a circle. All very geometric. But is it how we truly experience time? I can only speak for myself. This tidy abstraction lays over my peregrinations and comes into conflict with my animal body and brain which rarely move in a straight line. The experience I have of the turning seasons feels much more powerful and “real” than what the calendar tells me. In our culture, we use a calendar developed by a bunch of old Romans (who purloined it from those they conquered). It was later modified by a long-dead pope, and we are still sticking to it. Hebrews and Chinese use an older, lunar calendar which is a bit more flexible. Calendars help us be on the “same page” as groups, communities and societies. If left to my own devices, I would observe the passage of another year at the winter solstice. Or in spring when green life returns to this hemisphere. That would feel more congruent to me. So I was going to let New Year’s Eve pass unnoticed except for being awakened at midnight by ruckus. The offer to ride shotgun in a snow cat over Table Mountain came up, and I thought “Why not?” I’d never done it before. This area is a destination for winter recreation. Our winters are filled with more snow than rain, and thanks to Interstate 90 it’s easy for a large urban population to get here. Take your pick–the place where I work offers 500 miles of groomed snowmobile trails, 40 miles of groomed crosscountry ski trails, and more miles of marked trails for skiing and snowshoeing. The most intrepid make their way into the backcountry by finding their own routes using any mode of over-the-snow travel. Those 500 miles of groomed snowmobile trails require frequent grooming to keep the routes visible and smooth. Ungroomed trails are rough and bumpy with moguls. New snowfall can make them disappear. Wind can pile drifts that swallow a snowmachine. Tim was grooming over the top of Table Mountain. It was the first run this season, and I was along to help in case there were trees across the trail. We would have to shovel snow away from them in order to reach with the chainsaw. It’s heavy work logging out in the snow. And in the dark. Trails are groomed at night so that the cooler temperatures help the snow to firm up. We left the shed right at dark and were on the trail. Tim explained what he was doing–using the blade on the front of the cat to cut the width of the route and shear off bumps. A tiller is attached to the back of the cat which churns the snow like a 14 foot wide rototiller. On top of that, rubber skirting is dragged, smoothing it all to a perfect corduroy texture. All of these things require constant adjustment, and he was focused on the snow curling in front of the blade, his hands on the controls. a little kid. The present moment overlaid with memory. Memories of riding in the back seat of the car, looking out at the landscape passing by. This has always made me very happy because I am a visual creature. I can stop thinking in words and just sense. Doing this slows time waaaay down. Gazing up into the snow subalpine firs was magical. The symmetry of them left me nearly breathless, and I finally understood how perfectly they are designed for snow at high elevation. Tall and narrow, their stiff branches circle the bole in whorls. 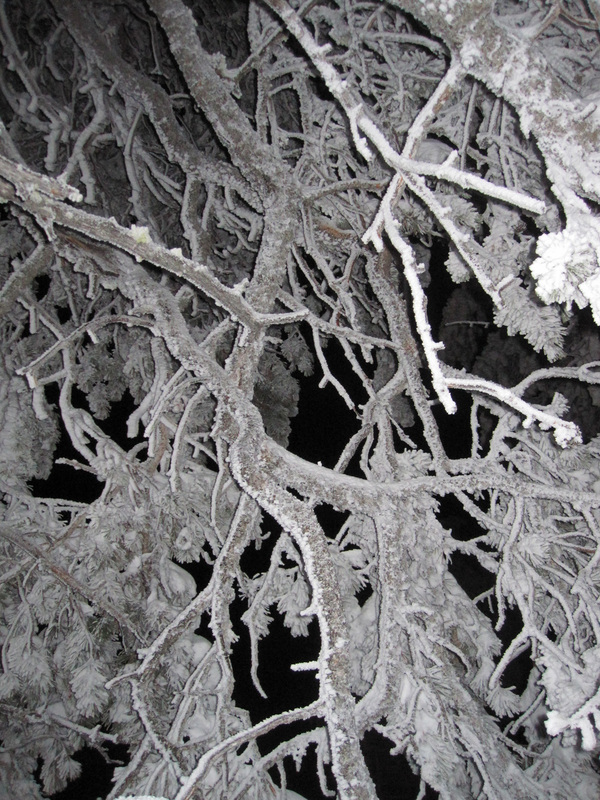 Except now those branches flex gracefully downward under a load of white powder. The are skinny umbrellas. They are elegant spires. They are straight out of Dr. Seuss. They are lacy confections rising into the deep blue night. As usual, I am wondering how to translate what I see into drawing or painting. But then conclude that would be entirely inadequate because I don’t know how to convey the sense of space on a flat surface. 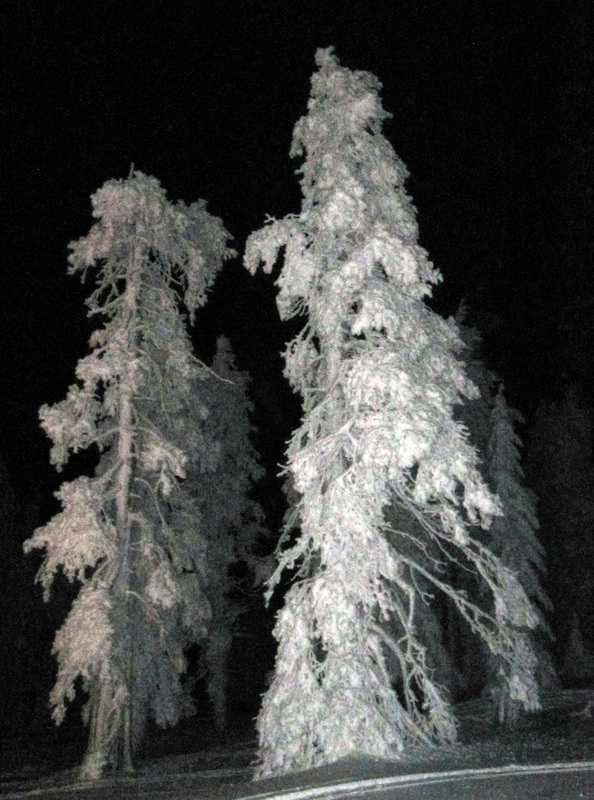 The air around the trees is deep, and the light shows how round they are, jutting into the darkness. They exist in three dimensions, and I give up thinking about flat art. Photography is no good either. My photos look like X-rays, and the subtlety of the color has been lost in the flash. This night is not black. It’s the deepest blue. Palpably dark and opaque, nearly purple. I sense the mountains breathing around me. When the cat goes by, the snow sparkles–just small glints of red and green and blue and pink and silver and gold. Like the northern lights. Like the stars. All the heavens captured in snow. There were no logs to cut. None at all. I had the saw ready, but it rode on the back of the cat getting covered with rime. We stopped from time to time to stretch our legs and pee. Good to move, and feel the cold. Then get back in and keep going. The final overlay that occurred to me is winter. I am intimately familiar with the road we traveled. I have known it for 20 years, from the first spring snow melt and emergence of wildflowers to summer drought and golden autumns. I have worked on all the trails many times, explored the forests and meadows on my own time, and camped here and there. Rain, shine, thunderstorm, wildfire. Solo and with colleagues, friends, family. So I know the lodgepole plantation on the corner. The place near the basalt rim where the trees are shaped by the wind. The meadows and crossroads. I know them in summer and now I know them in winter at night. I confess I dozed off on the way back. It was getting monotonous; deadly for the passenger, says Tim. I would pop awake and see him attentive to the roll of snow tumbling in front of the blade and the feel of the tiller in the trail behind us. Then I would stare at the roll, hypnotized by the coming together and letting go of snow. It’s incredible stuff. We got back to the shed and had to scrape the ice off the cat before parking it. I was longing for my warm bed, and stomping around in knee-deep powder woke me up. Finally our work was done and we headed home on the deserted highway. Bottle rockets flew and popped over Swauk Creek. Reaching the lowlands and the valley where our town lies, we saw flashes reflecting off the bottoms of the clouds. More fireworks. It was not yet midnight, but revelry was proceeding. I staggered into my house to bed, wondering at my rough tough Henry cat who has taken against fireworks. He’ll chase a dog five times his size out of the garden, but loud noises are not his cup of tea. We curled up and went to sleep, rousing a little for the big booms. Then it was quiet. I woke in the light to find a thin blanket of new snow. The morning has passed without me paying much attention to the clock. I realize–damn!–I’ve got to get a new calendar. For what it’s worth, Happy New Year, 2012. May it be a better one for this little blue planet and all the beings upon it. 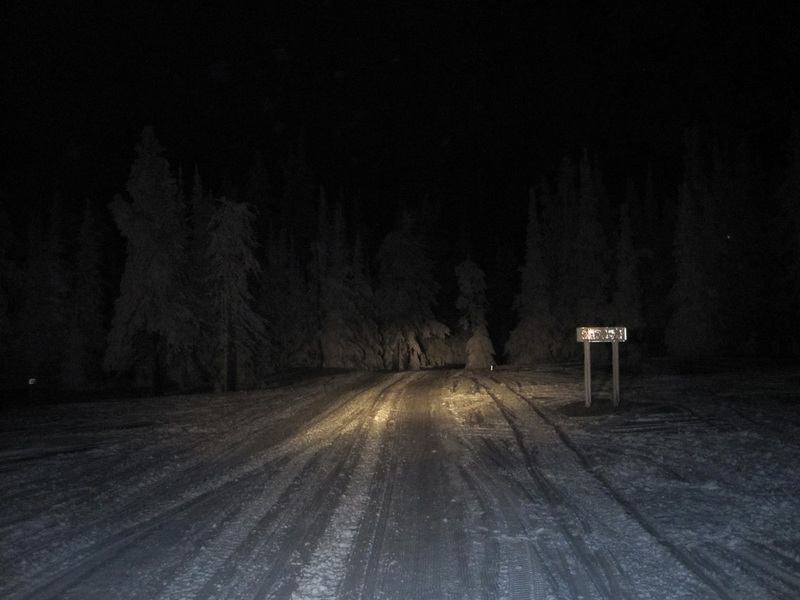 I loved this ride through the snowy high country night of purplish and cobalt hues. Some of your photos take my breath! What a New Year’s beginning! One thing you said flashed me back to 1950.. to the feel of rough fabric upholstery on the old Chevy’s back seat, sweet summertime warmth and dark washing over my bare arms, my face.. the din of katydids when we passed a field, the quiet as we travelled past woods that separated them. We’d be on our way home from the weekly grocery shopping jaunt. Winter was far away.